Living in a Western culture your life is compartmentalized. Maybe not across the board but largely so unless you’ve made a concerted effort to change what’s handed to us. That means creative expression is separate from work, which in turn is isolated from spirituality. Possibly the closest overlap may be spirituality relating to family or relationship. Or if you’re in a creative field of work where your deeper needs may be unleashed. Such disconnection results in dissatisfaction—an underlying sense of emptiness and lack of freedom that snowballs over time. Containment. I’m quite sure it wasn’t always that way but probably began with the Industrial Revolution and a move away from the land and community. The fact remains: it’s undeniably present. People attempt to fill the hole with ways that don’t work and are often quite harmful. I had two reminders recently that initiated this post. A young woman from Los Angeles came into The Gallery in Williams, an artist cooperative where I’m a member. I happen to be on duty. When we struck up a conversation, I identified myself as one of the artists. “He’s a full-time artist. But I work in a corporation. If I ever have time, then maybe I can do a little something.” Her shoulders slumped, and I could see she rarely had the time or energy left over to devote, given her hours and pressures at work. Full moon over Bolivia. 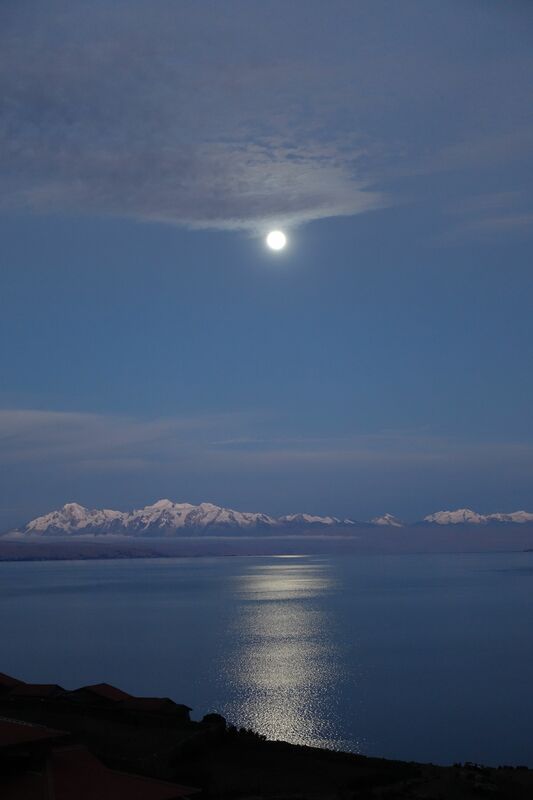 View from Island of the Sun, Lake Titicaca. ©2015 Carla Woody. All is soundly grounded in such a way that gives life meaning and depth throughout. I have so much gratitude for this exposure, which has taught me the “how.” After a time of repetitive experiences, I consciously began to change how I live my own life. In the beginning, it seemed radical and difficult. Now it would be so to live any other way. Any aspect of my life organically dovetails into another. Modesto, long-time Q’ero friend and father to my godson, making prayers to the Pachamama (Mother Earth) and Apus (sacred mountain spirits) during ceremony outside Cusco. ©2015 Carla Woody. 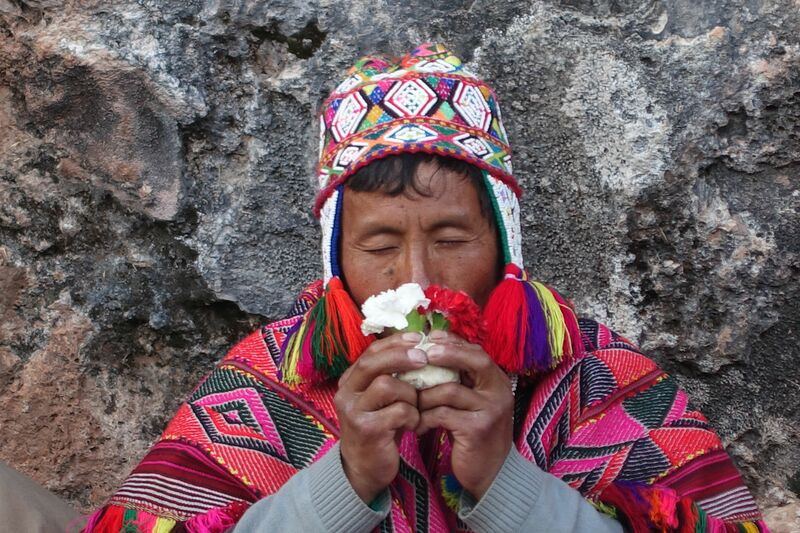 I’ve just returned from this year’s spiritual travel program in Bolivia and Peru. Our Hopi program is coming soon in March, an opportunity for a solid week of witnessing what I discuss here. So my thoughts on integration are very present. In closing circles I’ve heard concerns from travelers whether they’ll be able to experience the same depth at home. Of course, you can. Any deeply spiritual experience lives inside you always—no matter the form of its delivery. It becomes part of your identity and can be readily called into consciousness if you need a reminder. When you live through your spiritual values, there’s a trickle down effect shaping who you are in the world, what you believe about yourself and others, how you approach matters, what you create. It doesn’t even involve talking about those values. Yet, all shifts. It’s often visible to others as well. Even if they can’t put their finger on the difference. I long ago realized folks come to engage in these journeys for reasons they may not be able to articulate but are present throughout all the same. It may play out in different forms but the desire for clarity, resolution and integration are primary and inform re-entry home. We’re all tested all the time. It comes down to belief about possibility, choice and knowing the “how to.” It means staying strong so you can walk through life with grace. It means knowing the full sense of your birthright and giving yourself a chance to own it. *That doesn’t mean influences for Indigenous peoples to get off track are nonexistent. There are, mostly coming from Western ways. If they give in to them, the same angst occurs and harms wellbeing…maybe more so because their blood knows another way. Invitation: Join us for our December 4-5 Spirit Keepers Series in Phoenix where Eli PaintedCrow, Yaqui-Mexica Wisdom Keeper, and I offer a primer on ways to walk in two worlds—Indigenous and Western—and live through spiritual values. Donation basis. A few months ago I discovered The Moth and I’ve been addicted every since. The Moth is all about storytelling, not by famous writers but mostly, everyday people—true stories. The venues come via live events, radio and podcasts: stories about life circumstances, discoveries and lessons. At turns, the tales are funny, informative, poignant, uplifting, surprising. Sometimes the storyteller’s voice cracks with emotion. For every one I’ve thus far heard I’ve been touched in some way. Better yet, I’m not listening to or watching some kind of drivel that’s so prevalent these days on TV or radio. The narratives mean something. It’s about our humanity. For me, it takes me back to my childhood when we lived in France during the time there was no TV. (Yes, it was that long ago.) I used to lay on the floor next to the radio—riveted—taking in the old shows, imagining pictures in my head. I’ve opted to subscribe to the podcast so they’re automatically available on my iPad when it’s convenient for me. So they’ve entertained me on long road trips and kept me awake, when I’m cooking or other activities where I don’t need focused attention. Best of all when I’m relaxing after a long day. Launa Lea: Playing Parts about a worker at a community center who has a knife pulled on her. Janna Levin: Life on a Möbius Strip about a young astrophysicist finding wild parallels in her research and personal life. Kodi Azari: The Perfect Human Hand, a surgeon detailing his involvement in one of the world’s first-ever hand transplants. Jason Schmidt: Sit Tight, Kid, who as a boy realized his father was not a superhero, just a man who did his best. Go here to peruse the archives, see if there’s a live event near you or subscribe to the podcast. And…if you have a story and want to tell it, contact them. That’s how The Moth fills their shows.